Like last year, we have a lot to be thankful and grateful for this Thanksgiving. I'm thankful for Ryan, who does not realize how strong he is and how much joy/happiness he brings to my life. 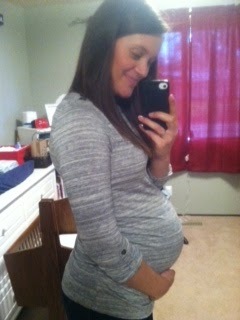 I'm thankful for this dance-partying baby boy that is still cooking in my belly. If my belly button was any indication - it'd be telling you this little turkey is done. I'm beyond thankful for our families and their love and support. I'm thankful for friends who are family. I'm thankful for our health and the continued health of our family and friends. I'm thankful for our two sweet and crazy pups. I'm thankful for the walls of our home and the security of our jobs. I'm thankful that the end of my graduate program is coming closer into view. and last but certainly not least, I'm thankful for the new adventures and challenges that will soon be upon us. I love this all! Eeee! I cannot wait to meet Baby Boy Peters. Seriously. Come out now!